Goodreads summary: "Everything is in ruins. Nights in the Debauchery Club, beautiful dresses, glittery make-up... and tantalizing ways to forget it all. But in the depths of the club — in the depths of her own despair — Araby will find more than oblivion. She will find Will, the terribly handsome proprietor of the club. And Elliott, the wickedly smart aristocrat. Neither boy is what he seems. Both have secrets. Everyone does. And Araby may find something not just to live for, but to fight for — no matter what it costs her." It was fabulous and dark and twisty and I just want more! What are you all waiting for? It's out now, go read it/order it! I didn't hate the love triangle either! I thought she did a gret job of making it balanced out between both guys. I'm glad this book has convinced you not to give up on steam punk. It sounds like an ah-maaaazing book! I'll definitely try to get my hands on it sometime soon. And I love "We are young", it's a cool song. :) wonderful job Daisy! I'm even more excited for Masque now! I'm so glad it has a decent love triangle! It's so surreal that you mentioned the beautiful song We Are Young! It's the song that reminds me of the book I wrote a review for all weekend and published today. "The Masque of the Red Death" is simply a great read. The author manages to craft a wonderfully refreshing story while staying true (I believe) to the spirit of the original. The atmosphere is glorious, the characters maddeningly mysterious and vibrant, the romance frustrating, frightening, fraught with betrayal, and delightful, the storyline satisfying and very different from the recycled plots that are endlessly repeated in most YA novels. I can't wait for the next one, which will be a definite purchase. 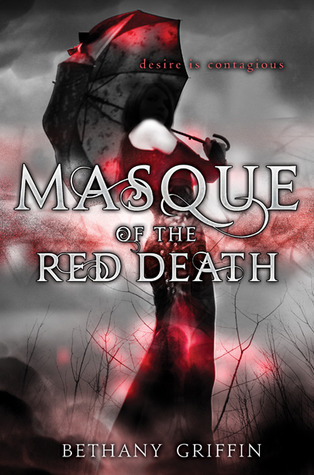 "The Masque of the Red Death" is highly recommended, and I'm crossing my fingers for the recognition it deserves. I hated the love triangle-I really loved Will and found Elliott to be kind of a sociopath-different strokes for different folks.